A man called Morden steals a giant robot designed by The Chief for lunar exploration. He uses the robot to go on a rampage of destruction with the aim of attracting The Doom Patrol. When they arrive to stop him Morden is able to fight them to a standstill and they are forced to retreat. <br /> <br />The Brotherhood of Evil are so impressed that they invite Morden to join their team which currently consists of The Brain, Madame Rouge and Monsieur Mallah. Morden is then dispatched with Mallah to attempt to steal The Statue of Liberty. 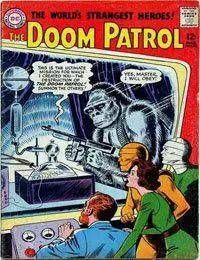 <br /> <br />The Doom Patrol already aware of what the targets might be are already waiting for them and both Morden and Mallah are defeated. They are still able to plant a bomb at the base of the statue which Elasti-Girl must destroy and they use this distraction to make their escape.